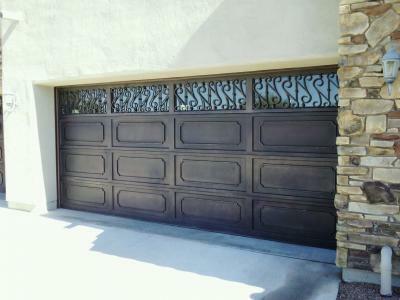 The garage doors above are iron garage doors designed and manufactured by Signature Iron Doors and installed in Phoenix, AZ. So many people only look to replace garage doors out of necessity when they break or when the finish is so damaged that even paint cannot salvage them. This is such a shame that what seems to be the largest surface area on the front of most homes is also the most neglected. Now you have the option to try and repaint your garage yet again or you can replace them with beautiful iron garage doors. These doors are unique to the market and are awe inspiring. If you are looking for minimal time spent to rejuvenate your home then a one day install of a gorgeous iron garage doors is the perfect fit. We invite you to explore our website and take a look at our gallery of numerous beautiful installs and transformations and we would love for you to contact us to speak to a representative and receive a quote for your very own iron garage doors.